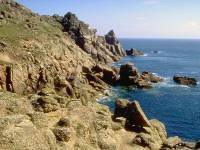 The first day's walk is one of five and a half miles along the Atlantic and English Channel coasts. 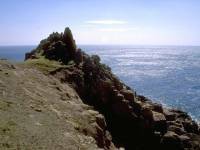 There are three reasons for keeping the distance short on this first day. 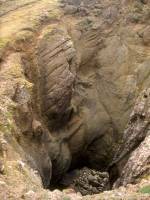 Firstly, and most obvious, is that you don't want to overdo it first time out, particularly if you're not all that fit. 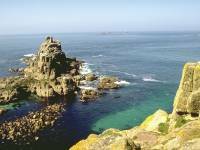 Secondly, it's likely that you'll spend half the morning just getting to the start from wherever you spent the night. 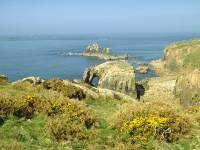 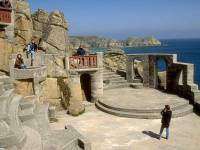 But thirdly, and most importantly, is that there is much to see along the route; clifftops and rock outcrops, coves and beaches, natural wonders that are more than inviting and which can be so rewarding to take some time over. 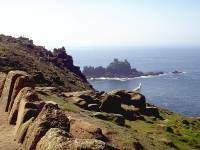 Penzance is fifteen miles away: you could do it in a day if you put your head down and marched along without looking at the scenery or anything else of interest. 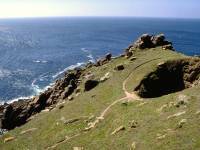 But there would be no point in such a march. 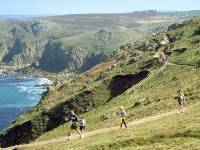 The scenery is here to be enjoyed; after all, why else are you doing this? 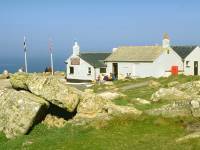 The Land's End Hotel (expensive) is the only place to stay in the immediate vicinity. 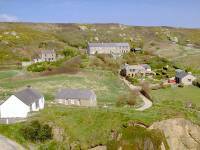 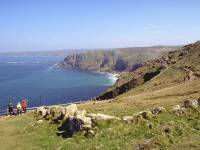 Guest houses and B&B at Sennen Cove, 1½ miles northeast. 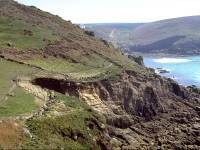 Plenty of accommodation at Penzance, about 45 mins' bus ride away. 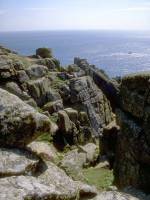 Nearest youth hostels at St Just and Penzance. 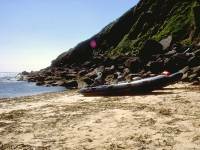 Campsite at Trevescan, one mile due east. 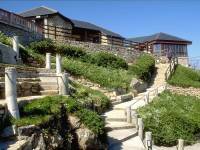 Cafeteria, coffee shop and hotel bar at Land's End Hotel; refreshments at First & Last House. 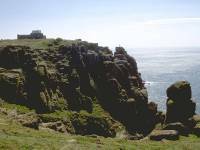 Land's End is the westernmost tip of Cornwall, and of England, and is generally accepted as the southwestern extremity of Britain and the starting point of all journeys from one end of the country to the other. 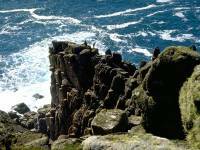 Land's End is a wild place. 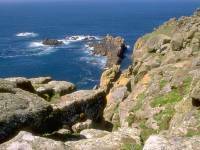 The Land's End peninsula is composed of granite, a rock that creates the bleak, heathland scenery of the area and which forms dramatic, shattered cliffs on its Atlantic face. 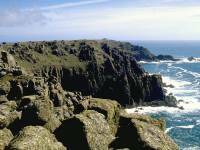 The first three miles, as far as Gewnnap Head, are among the most scenic of the entire End-to-End walk. 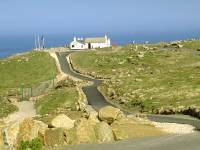 There is no habitation at Land's End; the place consists of the Land's End Hotel and its associated facilities, among which are shops and a theme park. 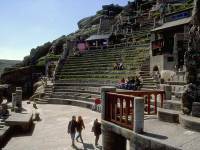 The place is geared to the entertainment of families and children and it has, overall, a rather tawdry air. 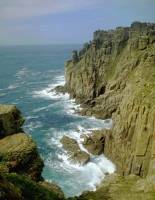 But the rampant commercialisation of this spot can do little to mar such a dramatic setting. 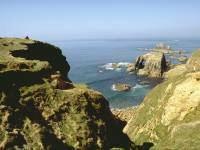 Look out to the west and you will see, well beyond the rocky islands offshore, the Longships Lighthouse. 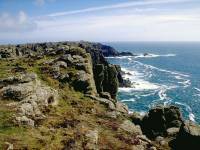 Beyond the lighthouse lay the Scilly Isles, visible on clear days, and beyond the Scilly Isles there is nothing else until Canada. 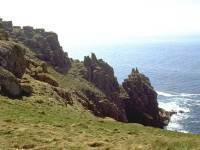 At the northwest corner of the hotel is the Land's End Sign; you can pay for a souvenir photo of yourself standing beside it, with the distance to your home displayed on one of the fingerposts. 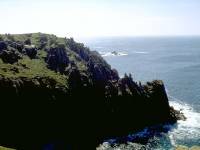 The sign is the "ceremonial" starting point of the walk, but the "practical" start, the westernmost point of the land, is a boss of rock known as the Peal that lays just below the First and Last House about 200 meters northwest of the hotel. 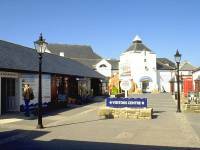 The First and Last is, of course, a souvenir shop though it also does refreshments. 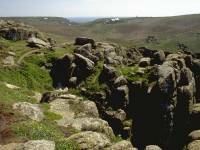 Walk out as far as you think is prudent; the path suddenly ends at an outcrop of granite boulders beyond which progress is very tricky. 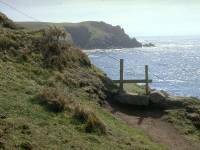 This is Mile Zero, the start of the walk to Plymouth, and ultimately, John O'Groats. 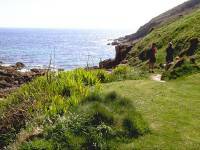 Walk back to the clifftop and along past the front of the hotel. 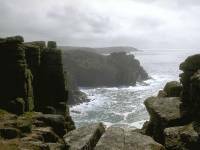 Your eyes will be drawn to the Armed Knight, an island of shattered rock several hundred meters offshore and colonised by seabirds. 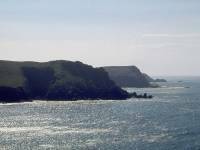 Another island, Enys Dodnan, lies a little further south. 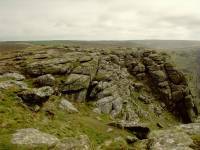 You can't fail to notice how the ground here is rippled and fluted; this effect is caused by wind and frost erosion and the tramp of many thousands of shoes and boots each day. 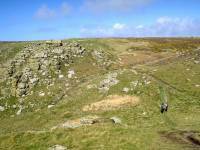 Make your way towards Greeb Cottage, four hundred yards south. 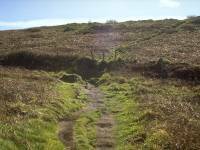 It depends on which route you take, but in all probability you'll approach Greeb Cottage over the footbridge that crosses the runoff from a small reservoir. 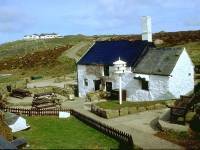 Greeb Cottage is a "show" farm and has a rather good model village in its garden, so it's worth spending twenty or thirty minutes there. 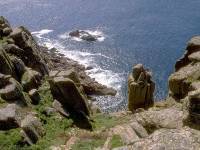 The Armed Knight is seen at its best from here. 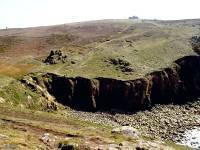 Keeping to the obvious path, leave the grounds of Greeb to round the prominent gully in the cliffside. 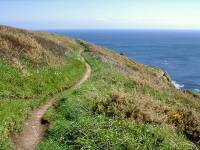 You now have a choice; stay on the main path or head right and walk out to the first major headland, Pordenack Point. 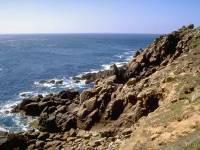 Unless you're really pushed for time you shouldn't miss the headland. 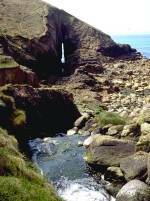 As you approach Pordenack, the offshore island of Enys Dodnan is seen to have a sizeable natural arch at its western end. 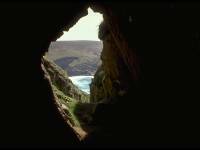 As you reach the point itself a glorious view opens out ahead. 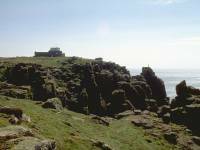 The massive granite buttresses frame the rocky beach of Trevilley Cove, while the lone cottage of Nanjizal and the coastguard lookout on Gwennap Head, three miles away, both come into view. 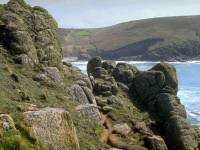 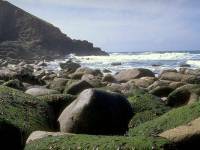 The knobbly rock towers of Carn Boel, the next scenic highlight, stand out across the cove. 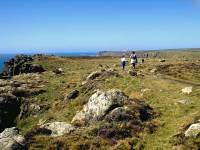 As you walk around Trevilley Cove you cross a ruined stone wall that marks the completion of your first mile. 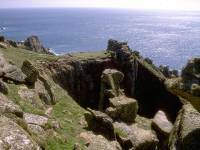 Carn Boel, like Pordenack, can be bypassed but it would be even more of a pity to miss it. 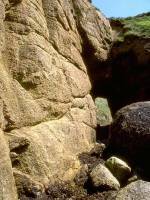 The rock architechture, seen up close, is awesome. 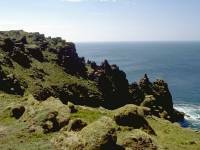 As you round the headland into Nanjizal Bay the next three headlands (Carn Les Boel, Carn Barra and Carn Guthensbras) appear in a straight line ahead. 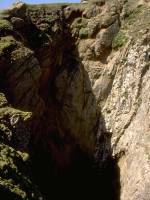 Take the path around the tiny inlet of Zawn Beeth, where the pink colour of the cliff indicates its relatively fresh exposure. 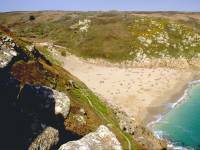 Just after you cross the stile half way round Zawn Beeth (the first of many hundreds on the route), take a look back at the beautiful, deserted little beach sheltering below the caves in the cliff face. 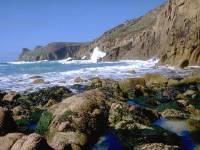 The beach is accesible only by boat and the caves are typical of the natural wonders of this Atlantic coast. 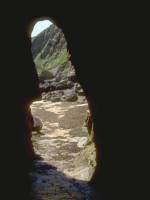 There have already been several such caves and arches but they have been visible only to those out at sea. 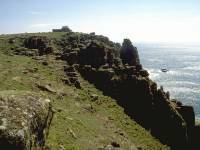 The path squeezes between rock outcrops to swing round into Nanjizal Bay proper. 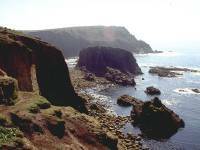 The bay is also known as Mill Bay, and the remains of a watermill may be seen at the foot of the gully below the cottage. 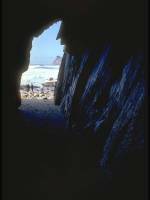 Stop to look back here and there; the rock architechture is superb and, on a breezy day, the waves crash over the rocks in a dramatic fashion. 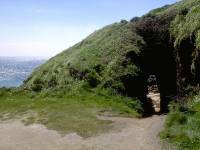 Look out also for a cave off the path to the left. 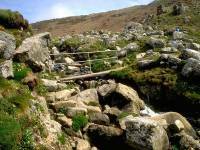 The gully at the head of the bay is crossed by a footbridge. 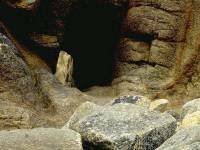 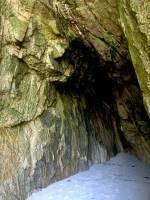 Take some time out here to clamber down to the rocky beach where a beautiful granite cave floored by coarse-grained sand opens back into the rockface. 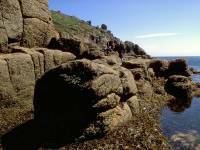 The enormous slit in the southern wall of the bay is even more awe-inspiring but it cannot be reached on foot even at low tide. 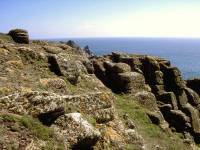 Note the large crystals of feldspar in the rocks hereabouts. 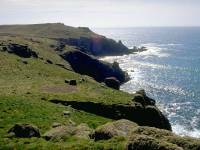 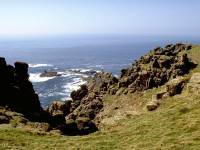 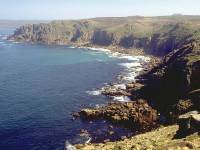 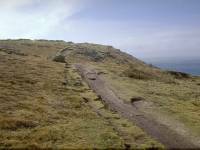 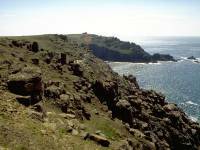 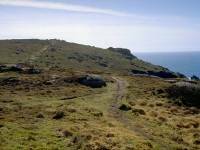 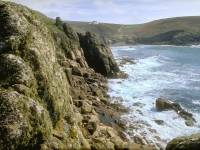 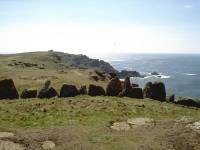 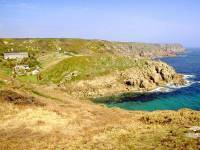 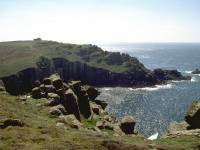 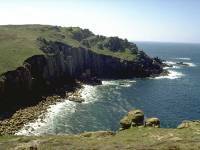 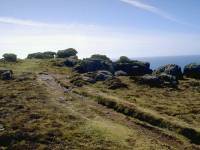 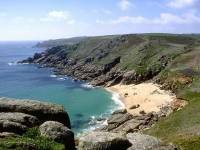 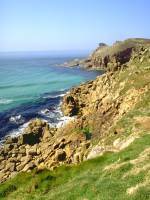 Now climb up out of the bay towards Carn Les Boel, the two-mile point of the walk. 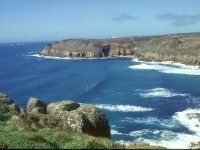 From this magnificent viewpoint the Land's End hotel reappears across the broad sweep of Nanjizal Bay, seen to its best advantage from here. 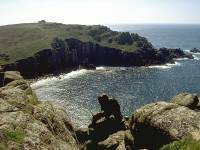 In the other direction you look out across Pendower Coves, a bay formed of a complex of several smaller bays and minor headlands. 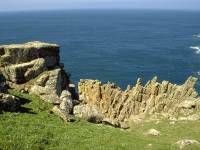 The many rock outcrops around the wall of Pendower are fascinating, although this is the point at which one tends to start getting a little blase about the grandeur of the scenery and the temptation now is to press on towards the next headland, Carn Barra. 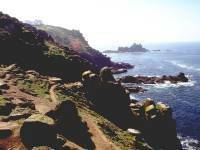 If you started out from Land's End at around 11.00 or 11.30, as is likely, then it's lunch time about now. 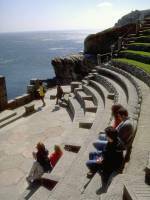 Find yourself a spot of level turf, out of the breeze, and enjoy the view. 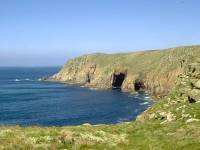 Carn Barra is where your brain goes back into gobsmack mode, for the scenery here is truly dramatic. 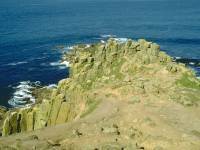 Across Folly Cove, about five hundred yards away, is the splintered, jagged rock tower of Black Carn. 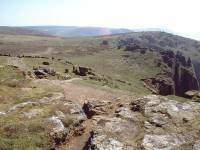 Black Carn is a daunting piece of rock and not a place to be unless you posess good rock-climbing skills. 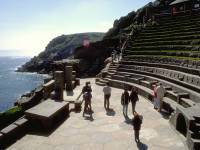 Ordinary mortals must be content to gaze upon it from the adjacent clifftop. 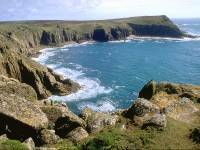 Beyond Black Carn is the bay of Porth Loe. 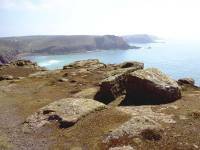 Carn Guthensbras is the next major headland seen across the bay. 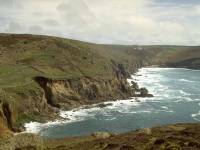 You reach the three-mile point just before walking down into the gully at the head of Porth Loe. 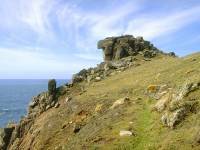 Carn Guthensbras is, for my money, the true southwestern tip of Great Britain; this is where the Atlantic coast ends and you turn left, or eastwards, to walk along the coast of the English Channel. 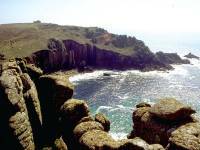 But I don't make the rules and it's Land's End that is the accepted starting point. 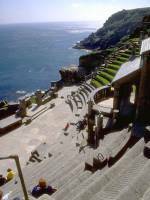 At least Guthensbras is unspoilt and uncommercialised. 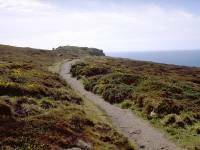 Don't take the path across by the coastguard station but keep to the edge of the land, where the scenery is at its finest. 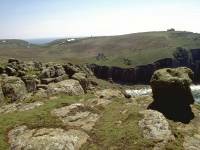 Take care, however, not to stray too far from level ground as the land falls away sharply. 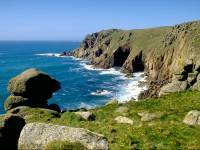 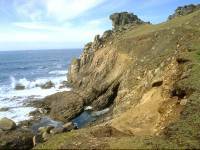 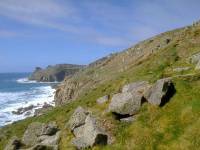 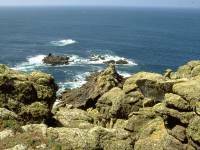 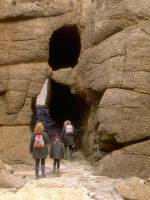 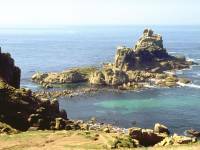 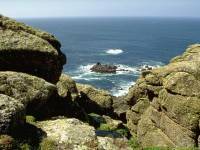 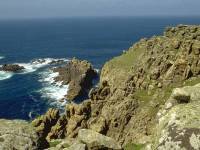 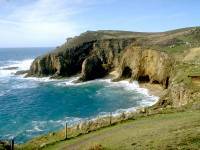 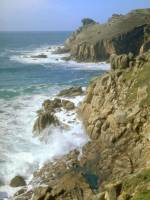 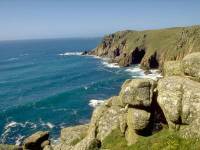 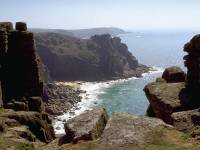 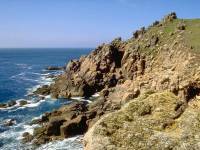 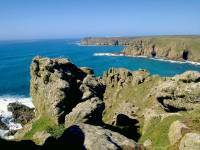 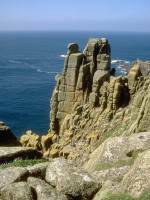 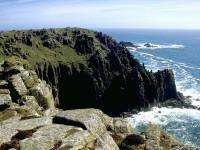 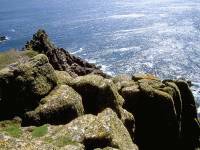 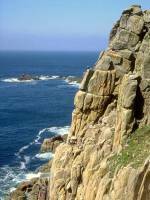 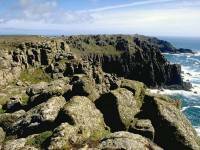 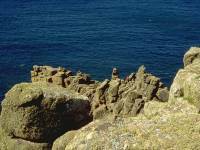 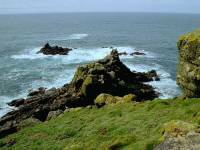 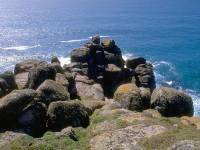 The fearsome rock formation immediately ahead , as you leave Guthensbras to walk eastwards, is Gwennap Head. 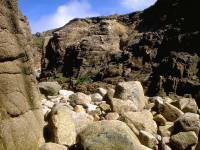 The tortuous rock formations immediately south of the coastguard station could easily be missed, yet they are arguably the highlight of the day. 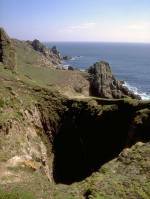 Two awesome blow-holes are situated just inland from the cliff edge and a path between them may easily and safely be traversed provided that the ground is dry. 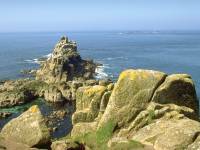 The rock towers at the cliff edge are sculpted into fantastic shapes by wind, sea spray and frost erosion. 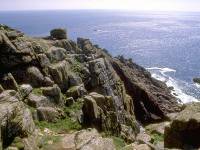 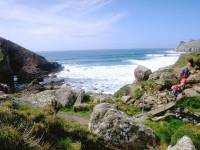 Once you can tear yourself away from Gwennap Head, stroll across to nearby Hella Point and you'll have an excellent view of Porthgwarra, England's first village, nestling in a gully below you. 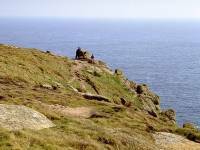 If the air is clear you should get your first sighting of Lizard Point, some thirty miles away east southeast. 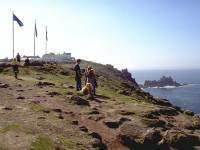 Take a last look at the Land's End hotel, three and a half miles back, and descend to the village. 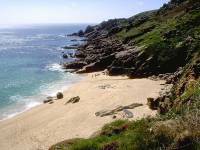 As if Porthgwarra wasn't charming enough it also boasts a superb little beach that can be approached through a rock tunnel from the tiny car park. 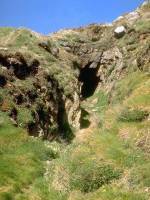 There is a large cave adjacent to the tunnel, similar to the one at Nanjizal. 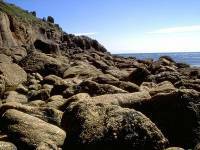 The granite boulders of the beach are at their coarsest and reddest here and the feldspar megacrysts stand out sharply. 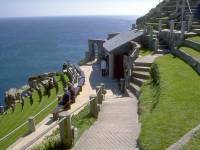 Refreshment kiosk by car park, seasonally open. 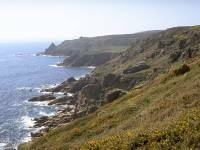 The official coast path leaves Porthgwarra by a lane beside and behind a rather desirable cottage, but if you're not pushed for time and can spare the effort then the seaward walk around Carn Scathe is rewarding. 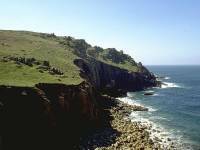 It quickly becomes apparent the the English Channel coast lacks the sheer grandeur of the west-facing Atlantic seaboard, and the temptation to linger at every baylet and rock formation dies away somewhat. 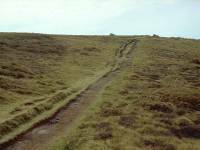 The path runs above a slope choked with scrub for several hundred yards before forking right to round the minor headland of Carn Barges. 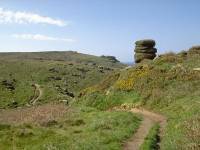 Note that the heathland of Land's End has been left behind and that fields and pastures now accompany the path to the landward side. 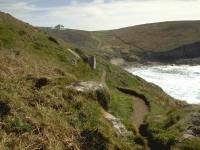 As you draw adjacent to the tiny village of St Levan, just a couple of hundred yards inland, the path dips into the gully above Porthchapel Beach. 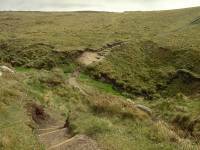 There is a path down to this beach but it is alarmingly steep; remember that if you venture down there you've got to climb all the way out again. 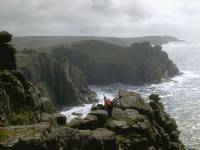 Having gazed in awe at the natural wonders about you, prepare yourself now to be awestruck anew by one of the most incredible man-made (or in this case, woman-made) wonders of the Cornish coast. 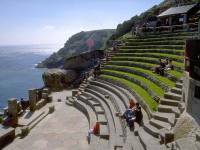 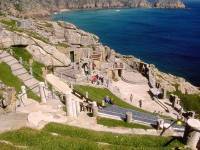 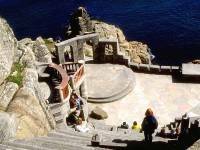 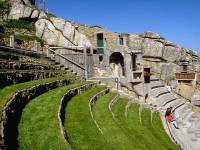 For it was here that, in the 1930's, Rowena Cade began work on the design and construction of an open-air theatre in a half moon-shaped gully on the cliff edge. 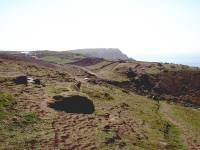 The story of its conception and creation is too long and involved to tell here, and Ms Cade herself no longer lives, but her monument lies below you in all its glory. 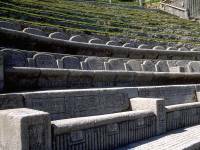 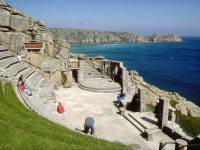 Construction of the theatre has been a long and gradual process, spanning over 50 years. 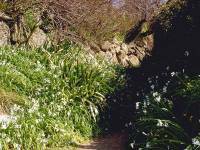 Much of the physical work was done by Rowena herself, although she had the services of her gardner for the heavier tasks. 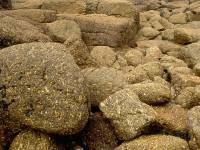 She worked in concrete (hauling stone was too much for her), mixing it herself from sand she carried up in bags from the beach. 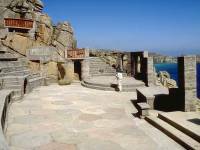 The auditorium and stage have been gradually extended and the theatre now boasts a seperate dressing room complex and a visitor centre. 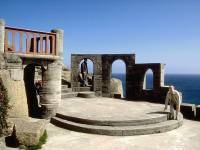 Performances take place on summer evenings and are very well patronised; the programme is diverse but the plays of Shakespeare and the operettas of Gilbert & Sullivan are the most preferred works. 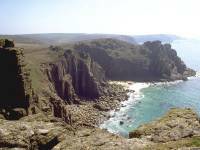 The wedge-shaped beach below you lies seawards of the village of Porthcurno, our finishing point for this first day's walk. 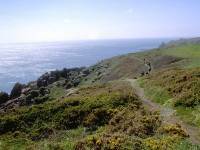 The path down to the beach is excessively steep; this is arguably the steepest descent of the entire End-to-End walk; those who would rather not tackle it are directed to the road from the theatre car park down to the village. 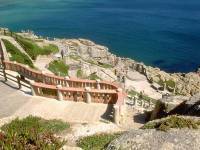 The bus terminus for Penzance lies at the far end of the car park above the beach but this might be a good opportunity to explore Porthcurno's second visitor attraction. 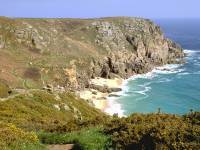 Porthcurno is a company village; it is almost wholly owned by the Cable & Wireless company, for Porthcurno Beach is the landfall site of Britain's transatlantic telephone cables. 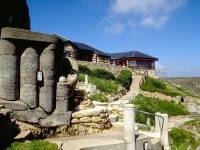 The company maintains a museum here, and it's a fascinating insight into the pioneering days of telegraphy and communication. 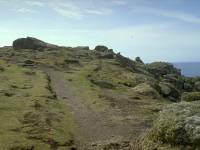 Tours start from the cable hut at the head of the beach; if you're too late to join one you're strongly advised to try again in the morning before walking on to Penzance. 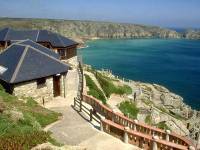 Beach cafe and shop on west side of beach, on road up to Minack theatre. 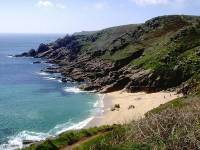 Very limited amount of B&B. 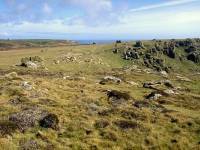 Campsite marked on map near Trendennen farm, ½ mile north.